Whatever OPEC says there is a feeling that the pre-shale days are done. But perhaps more on that in the New Year. 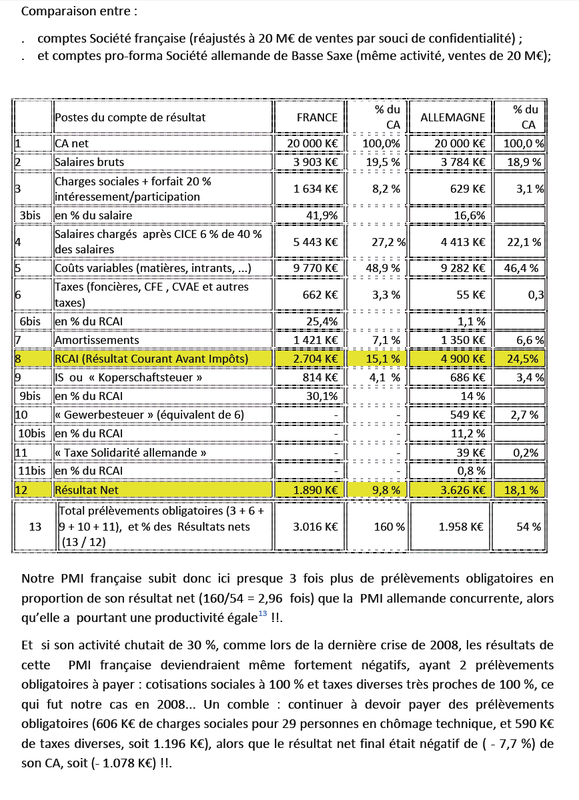 Someone took the trouble to quantify what most owners of small French business structures (ie under 250 employees) have known for a long time: they are getting a seriously bad deal compared to, erm, just about every peer one can think of. One of the key underlying points is that the French system has much higher fixed social charges (line 13 and 3 times those of the Germany peer expressed as a percentage of profit after tax). And there is never any relief for these even in times of crisis and losses (as described in the final para). Layoff costs, for example, will be borne by the firm whereas in Germany they would not be. But the authors do not simply moan about it. They offer four concrete suggestions to at least begin leveling the playing field. It is clear enough that peers, not only Germany but also those in Scandinavia, undermine the usual anti-capital arguments for soaking small businesses. It would be a bold step for an administration with not much more to lose to give the small business sector the shot in the arm it needs.